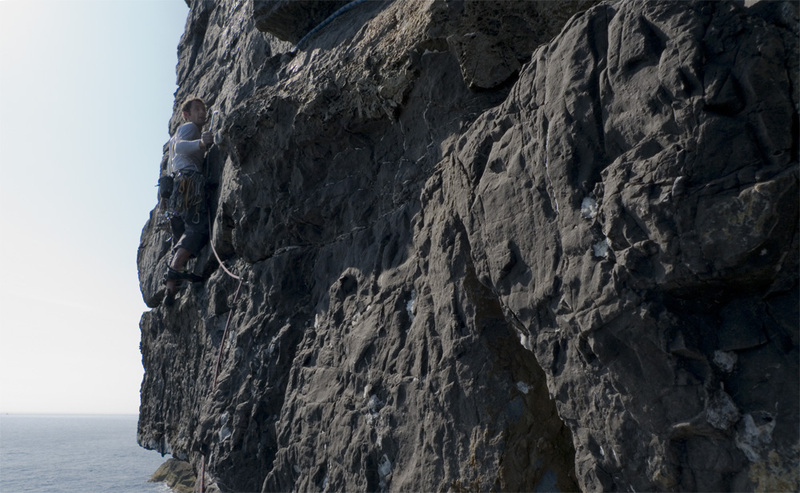 Just back from a brief trip to Pembroke, where I had the good fortune to climb with Jason Pickles. The last time I climbed with Jason, I think, was at Craig Doris many years ago. Or it might have been on the Tunnel Wall in Glencoe. Anyway, it’s been a while, but it was as much fun as ever to team up with him. Legend. After a quick evening hit to Huntsman’s Leap on Friday night with Pete, our team went to the military briefing on the Saturday morning to allow us access to the Range West firing area. We climbed on Saturday at Range West, which is somewhere I’ve never been before, and it is amazing. Jason and I climbed Tasmanian Devil on Greenham Common, surely one of the best E5’s at Pembroke, then we headed down to Mt. Sion East, keeping to the far right hand end, to be outside the bird restriction zone, marked by a red marker. 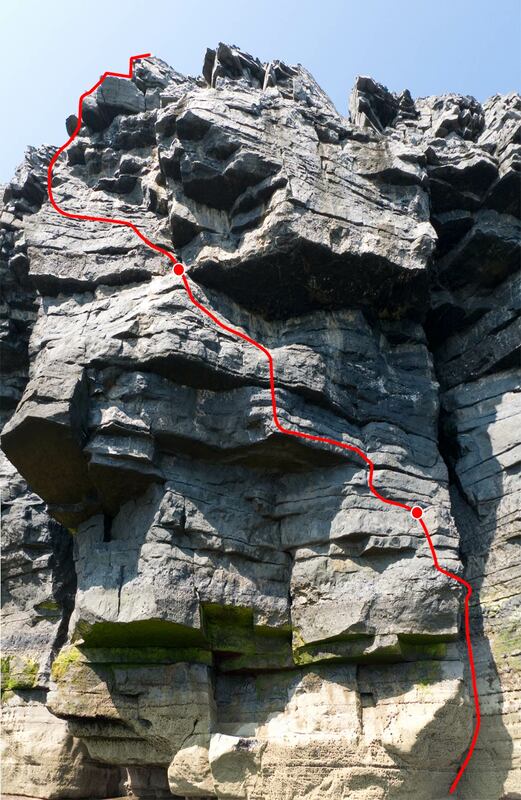 It instantly became obvious that there was loads of new routes to do, so I picked a line. Jason tried a direct first pitch, but was stopped by green slime, so he sidled off rightwards to an easy corner, and we missed out the slimy section. I then took over and in my unfit state battled my way across some big roofs, to a good belay. I only just made it, which made the climb very enjoyable. The final pitch was much easier, so Jason nipped up it and we headed off to Trevellan for some more normal Pembroke fare. Obviously this route might have been climbed before, but looking at the up to date file on the Climbers’ Club website, it doesn’t seem to have been. Who knows. I am really looking forward to going back to Range West when I am fit, without a dodgy finger. Mt. Sion Central is an amazing crag. Jason named the route Jew-Pac in memory of Mica Dash, who was a good friend of Jason’s. A couple of pics below. 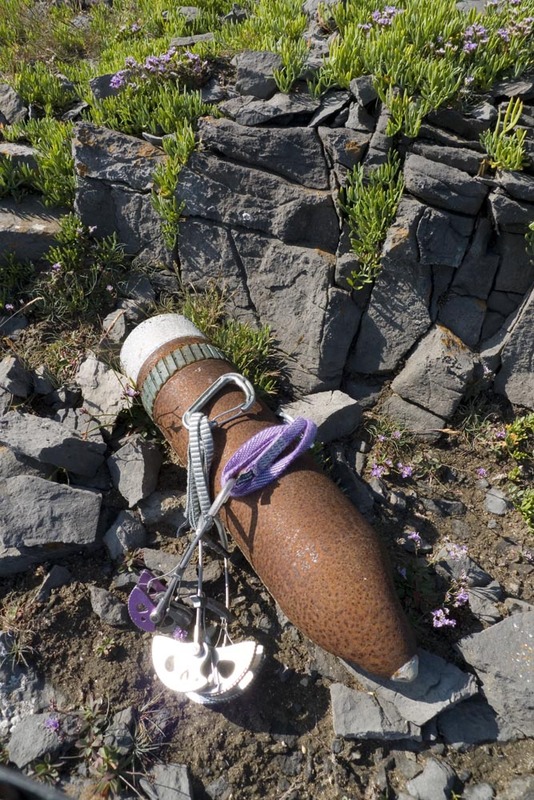 Not your usual abseil anchor!